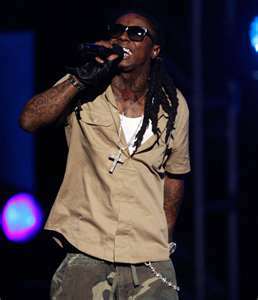 Double Up Radio: Lil Wayne's VMA Rehearsal: An Inside Look! 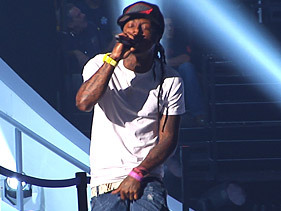 Lil Wayne's VMA Rehearsal: An Inside Look! LOS ANGELES — Fans were promised a rock-star-like Lil Wayne VMA performance, and judging from his stage rehearsal Saturday (August 27) at the Nokia Theatre on Saturday, Weezy F. will deliver for Sunday's big show. "We've been brainstorming and taking from things that we put together on the road, so I think they can just expect a new-and-improved Wayne, a different Wayne," Weezy's musical director Gil Smith told MTV News. "You know, he always comes different: One day he's a rock star, one day he's a skater; he's singing R&B. I think we can expect a little bit of everything in this performance." Backed by a full band, the Cash Money Billionaire ran through his set, which included a heavy-metal take on one of his songs. The energetic MC bounced around the stage as he worked out the particulars, perfecting his set. After the awards show, Wayne's C4 will be released at midnight on iTunes and other digital retailers before the physical CD version is dropped Tuesday. "The MTV Video Music Awards are one of the most watched and respected shows in the industry," Ronald "Slim" Williams, CEO of Cash Money Records, said in a statement. "Wayne is one of the most respected and prolific artists in the industry. By pairing the release of Tha Carter IV with the VMAs, it will certainly add to the overall anticipation and excitement for fans everywhere for what will surely be an unforgettable evening."